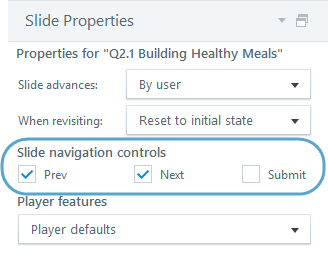 By default, question slides in Articulate Storyline have a Submit button, meaning each question will be submitted one at a time for evaluation and feedback will be displayed immediately. But what if you want all the questions to be submitted at the same time at the end of the quiz? You can do that, too. Just change the navigation controls from Submit buttons to Prev/Next buttons. 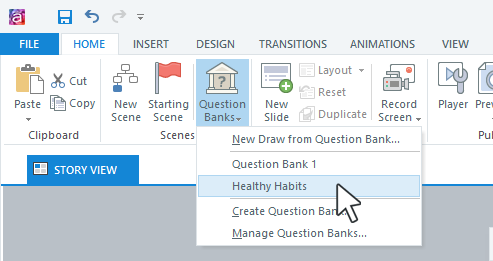 If your question slides are in a question bank, open the question bank for editing: In Story View, go to the Home tab on the ribbon, click Question Banks, and select the question bank that you want to edit. When the question bank editor opens, select the first slide, then use the Slide Properties panel in the lower right corner to mark the Prev/Next boxes and uncheck the Submit box. Select the next slide in the question bank and repeat step 2 until the navigation controls have been changed for all slides. If your question slides aren't in a question bank, switch to Story View. Select all your question slides. 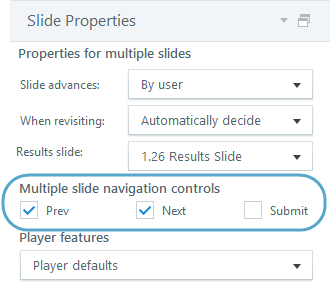 Use Shift+Click for consecutive slides or Ctrl+Click for non-consecutive slides. Use the Slide Properties panel in the lower right corner to mark the Prev/Next boxes and uncheck the Submit box. All selected slides will be changed at the same time. What Happens If Learners Skip Questions Without Answering? When you use Prev and Next buttons for navigation, it's easy for learners to skip questions without answering them. If they reach the result slide without answering all the questions, it'll negatively impact their scores. You may want to warn learners about skipping questions and ask them to confirm that they're ready to submit their answers before jumping to the result slide.